The Friday Night Lights event at the Morris Arboretum transforms the Garden Railway into a nighttime show. Morris Arboretum begins its holiday celebration Friday, Nov. 27, with the opening of the Garden Railway for the season. Miniature trains loop through an equally miniature village made entirely of natural materials – bark, leaves, twigs, hollow logs, mosses, acorns, dried flowers, seeds and stones. During regular hours, the Garden Railway is free with admission. Along the looping, quarter mile of track, visitors can spot Philadelphia landmarks. Fun fact: Independence Hall features pinecone seeds for shingles and twigs as downspouts. 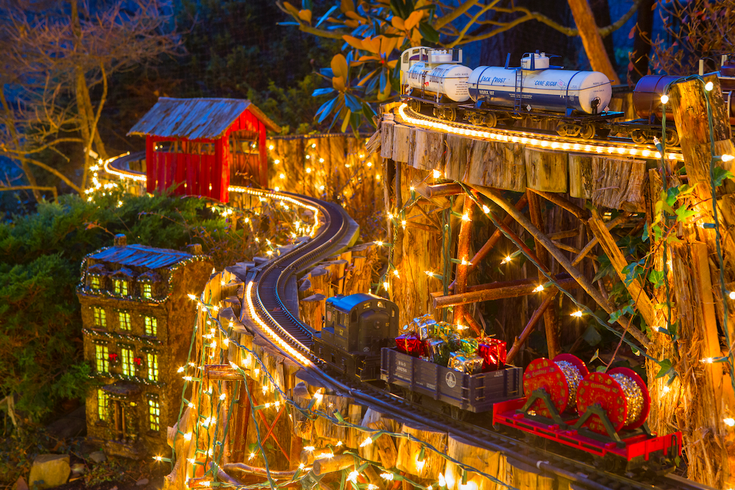 For the holiday season, the trains and miniature landscape are adorned in twinkling lights, which are best admired at night. Friday Night Lights, where visitors can enjoy the nighttime holiday Garden Railway, runs from 4:30 p.m. to 7:30 p.m. on Dec. 4, 11 and 18. Tickets are required: It is $9 for a member adult, $3 for a member child, $16 for a non-member adult and $8 for a non-member child. Visitors to Friday Night Lights on Dec. 4 will be visited by Pennsylvania Ballet's Sugar Plum Fairy and Mouse King from 5 p.m. to 6 p.m. for pictures. Then, on Dec 11, Bredenbeck's Bakery in Chestnut Hill will give away gingerbread cookies. On Saturday, Nov. 28, from 1 p.m. to 3 p.m., carolers will serenade visitors at the railway, and an ornament decorating station will be set up for kids. For adults who want to get into the holiday crafting spirit, there are creative expression classes available to make wreaths, tabletop trees or holiday arrangements. Cheryl Wilks, a floral educator and florist, leads each workshop, with supplies provided. Holiday wreaths can be made on Saturday, Dec. 5, from 10:30 a.m. to 12:30 p.m. The member adult price is $45, while a non-member adult is $50. The class for tabletop trees is Saturday, Dec. 12, from 9:30 a.m. to noon. The member adult price is $50, while a non-member adult is $60. A final holiday-themed class is offered Saturday, Dec. 19, from 10:30 a.m. to 12:30 p.m. Attendees can create a floral arrangement for their dinner table, fireplace or other home display. The member adult price is $50, while a non-member adult is $60.